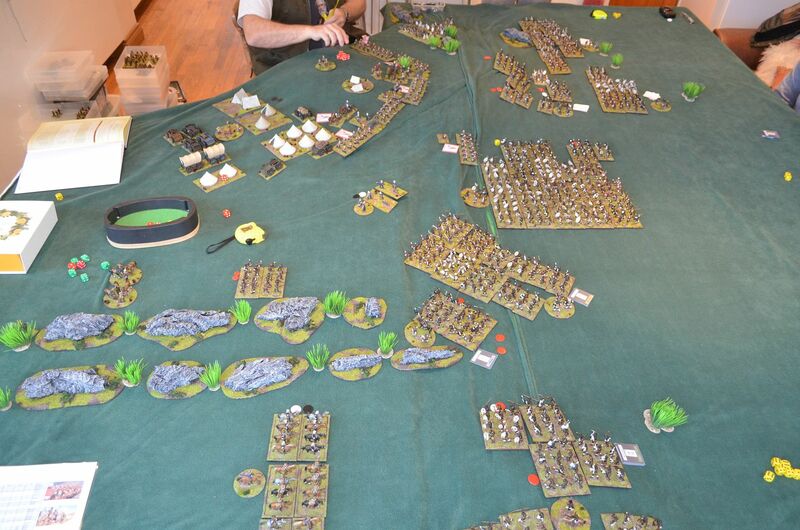 There can't be too many wargamers out there who have never watched the movies Zulu Dawn or Zulu and said wouldn't that be great to recreate those battle on the table top. This has always been on the top of my bucket list to re-fight these cinematic engagements and following all the hard graft to paint up hundreds of figures over the past six months my dream was finally realised. If you have been following my blog over this period you will be aware that I started this project when my father was sadly diagnosed with a terminal brain tumour. Sadly he passed away before he could see the fruition of these labours but the following is dedicated to him. On Sunday five of us gathered to commemorate those souls who fought and died bravely in the opening salvos of the Anglo Zulu war of 1879. The day was made even more poignant by the fact that Sunday 22nd was actually the anniversary of the battles of Isandlwhana and Rorkes Drift. 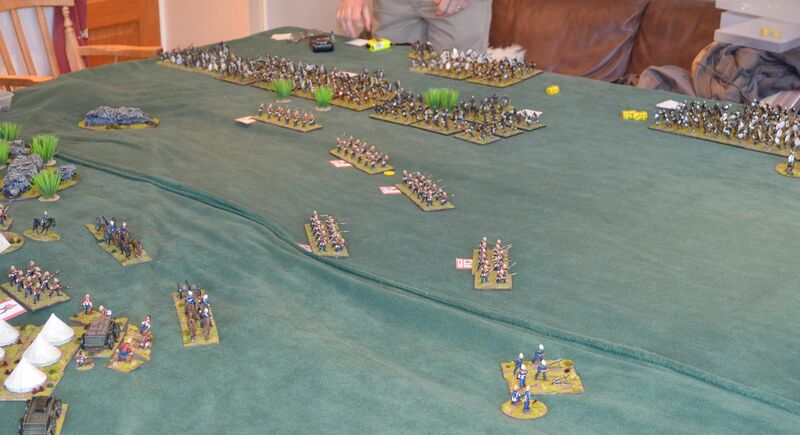 With the cold weather gripping the South East of England (temperatures barely above zero) the shed was out of bounds so our games were played out in the warmth of my kitchen. 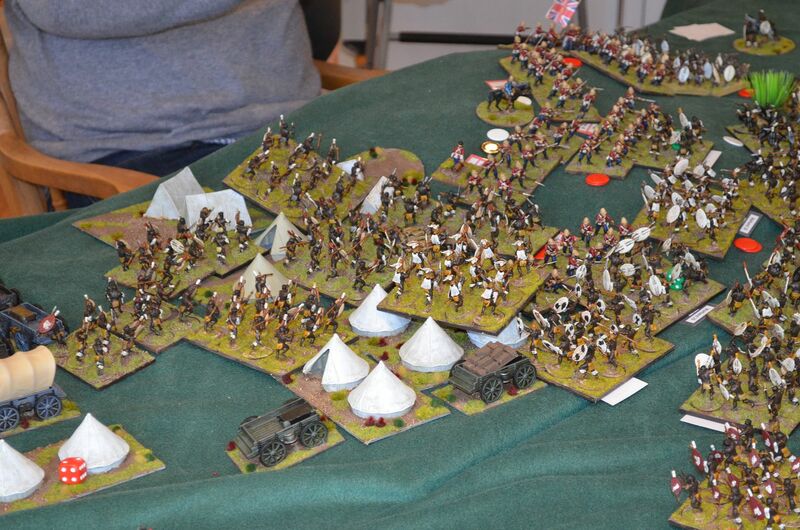 Kicking off at 09.00hrs with Bacon Sandwiches and gallons of tea the forces and players assembled. The morning would focus on Isandlwhana with the attention in the afternoon from 1pm switching to Rorkes Drift. The day would finish around 5pm - 8 hours of great gaming. 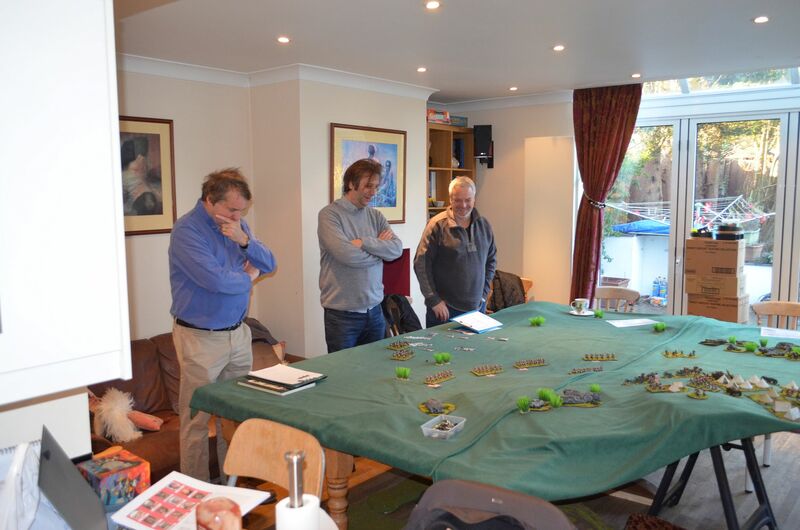 Setting the field for Isandlwhana was no easy feat as I had to draft in both a garden table and our dining room tanble to complement the Kitchen table. This ended up being almost 11ft x 11ft with the invisdible summit of the rocky outcrop of Isandlwhana sitting at the cut off edge of the dog leg. I'd bought some green fleece cloth to cover the tables (not the best colour) and under this we built up the slopes of the South African veldt. 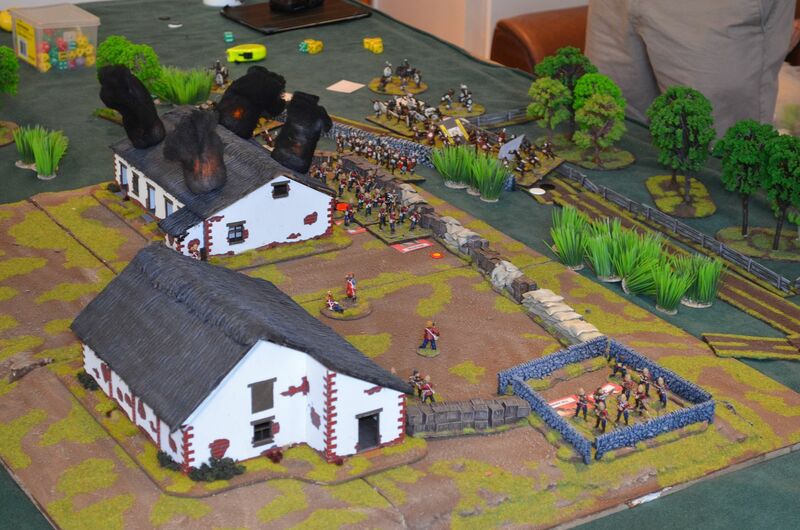 Both games were fought using Black Powder rules with some variations. These are explained in the following notes. 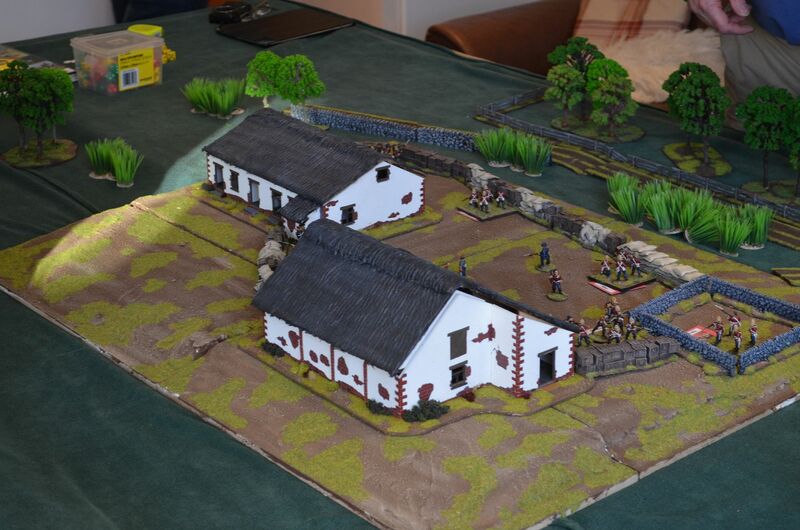 The British players (myself and Mark) would command the two columns who fought at the battle. 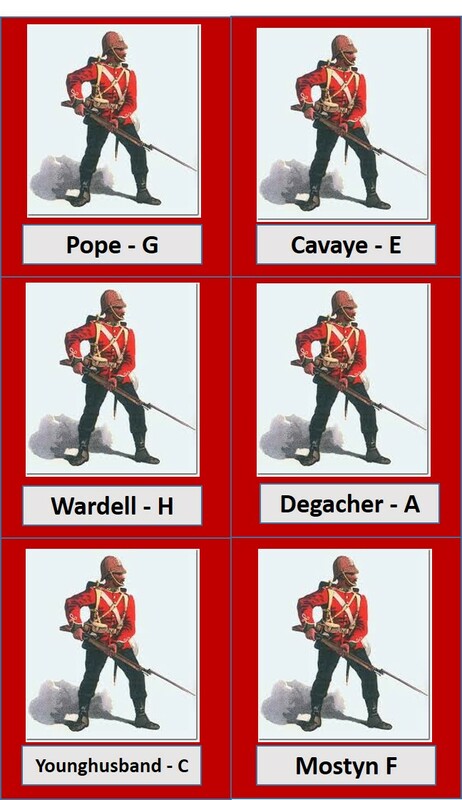 British Units and their approximate strengths. 11 Battery 7th Brigade R.A. - 3x 9pdr Rockets. Edendale Troop - 50 men. 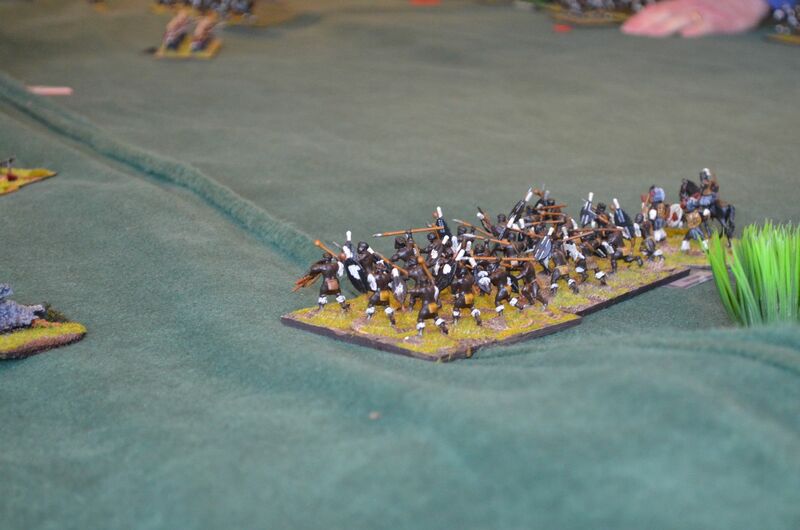 Hlubi's Troop - 50 men. 1/24th - 5 companies - 415 men. 2/24th - 1 company and detachment - 180 men. 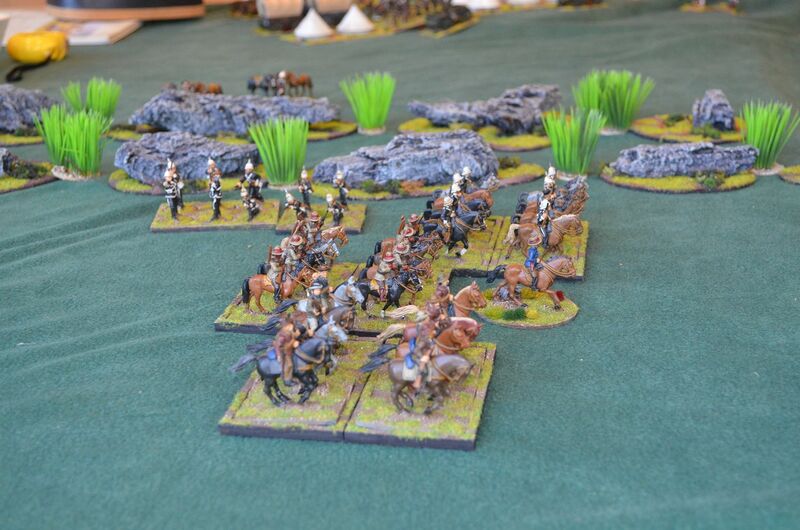 No.1 Squadron Mounted Infantry - 27 men. Natal Mounted Police - 34 men. Natal Carbineers - 29 men. Newcastle Mounted Rifles - 17 men. Buffalo Border Guard - 8 men. 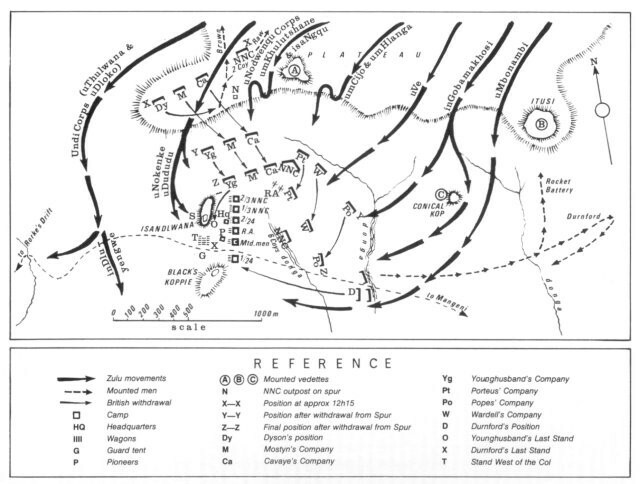 Five of the British Infantry companies have been deployed according to the map provided. 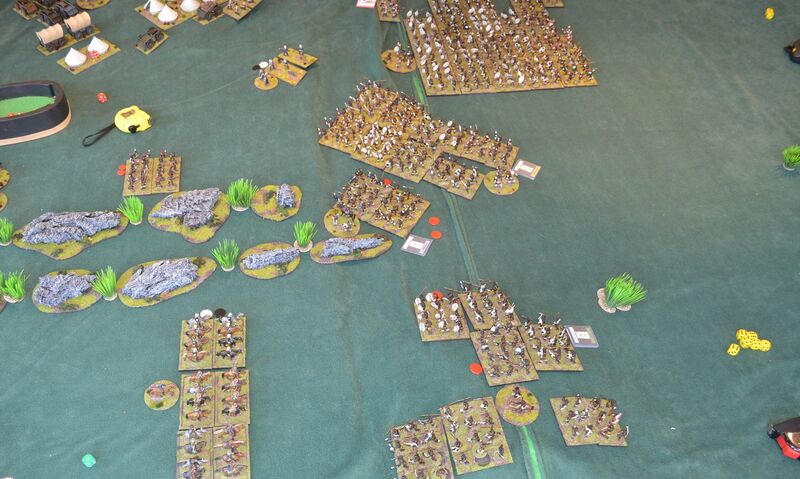 The Artillery will be limbered half way between the camp and leading unit of deployed infantry. 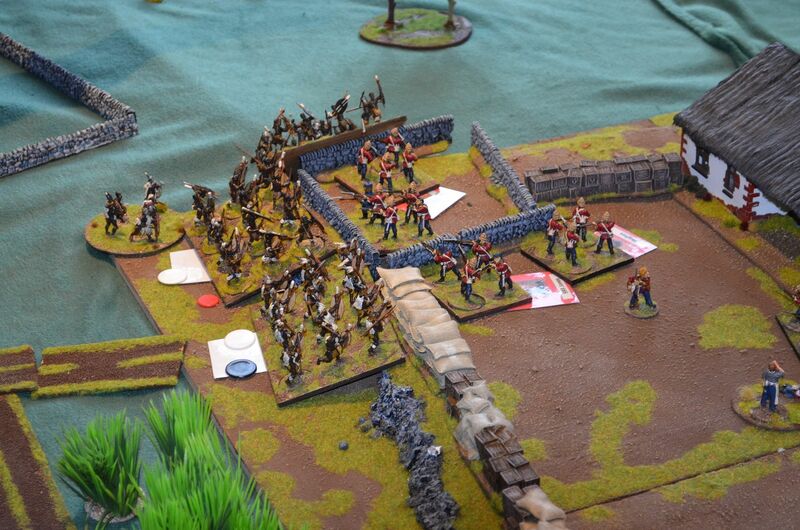 British line infantry were given the volley fire attribute and were steady and stubborn. 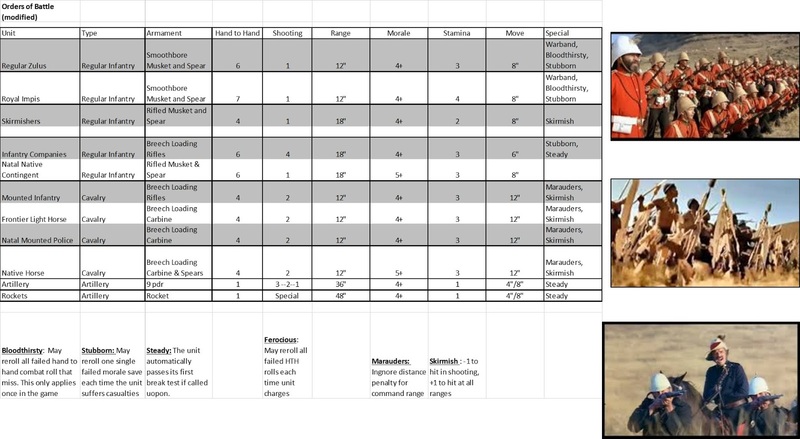 Furthermore to reflect the ammo issues of the British if a firing sequence rolled more 1's than 6's ammo became limited for the unit in question. 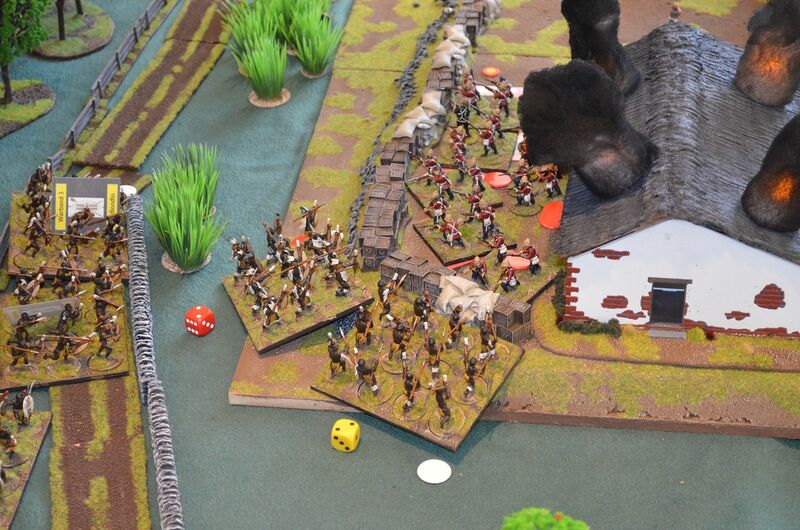 With ammo limited the unit lost one firing dice. 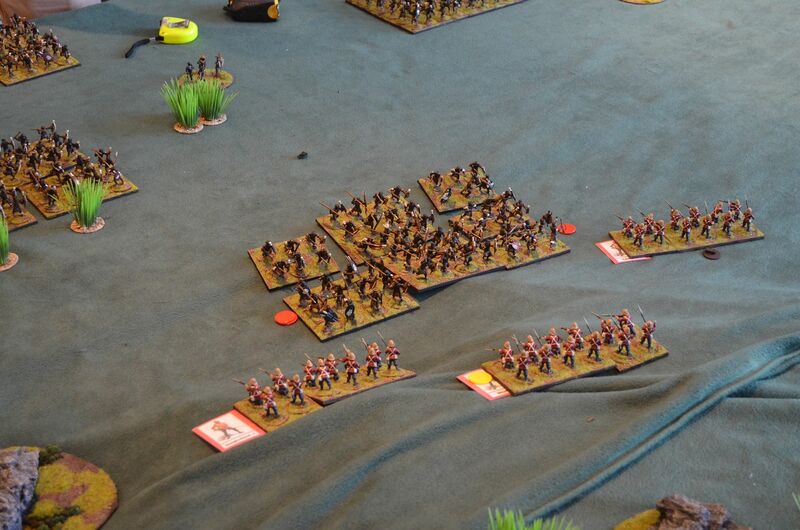 Each unit had an ammo runner who could 'run' to the ammo wagon and run back to replenish his unit. Zulu Units and their approximate strengths. Whilst searching for unit descriptions of the Zulu Army I discovered that an Impi is just a generic term for an Army/Regiments. 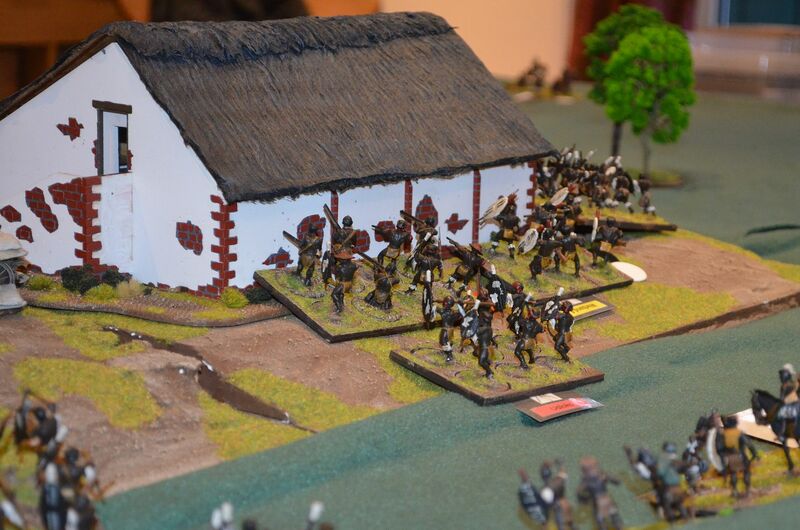 Regiments were actually called IButho’s and these were made up of several units called Amaviyo’s. 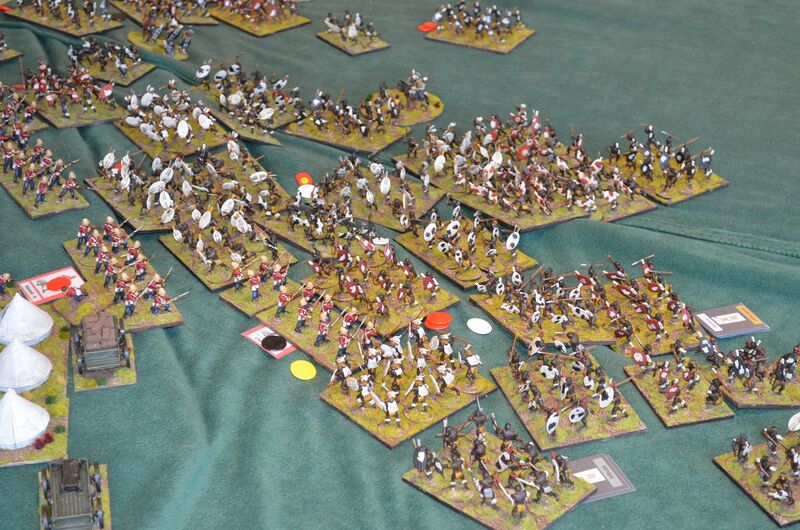 Amaviyos ranged in size from fifty to three hundred men. 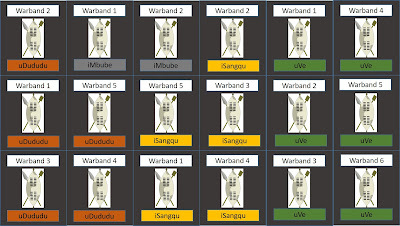 The Amaviyo will become my standard warband and each warband will represent 300 warriors. 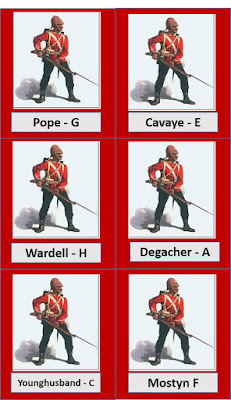 Cards for all of the Zulu Regiments were produced to aid identification of the units. 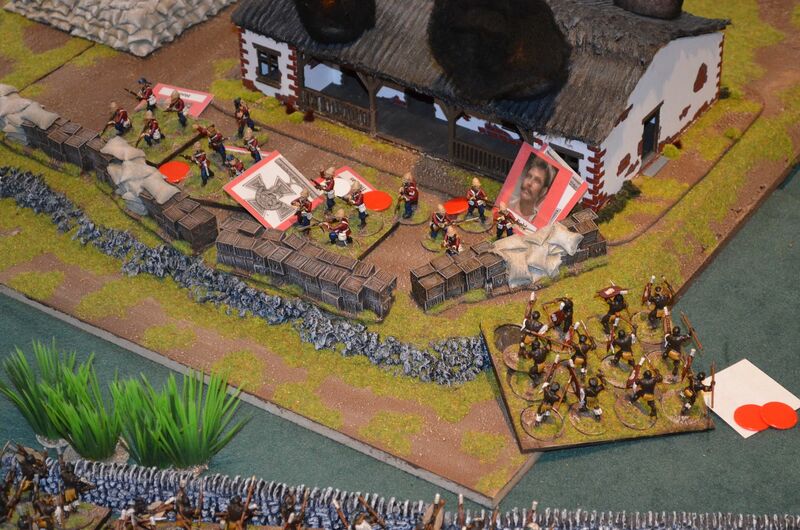 The Zulu player will receive one commander for each regiment. These are all +8 commanders. 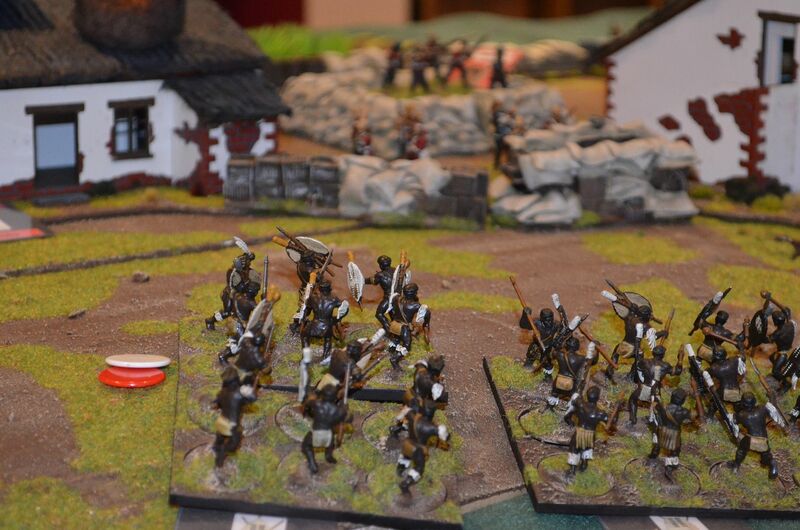 Zulu units all have the initiative ability that allows them to move forward one move provided they have not been ordered. 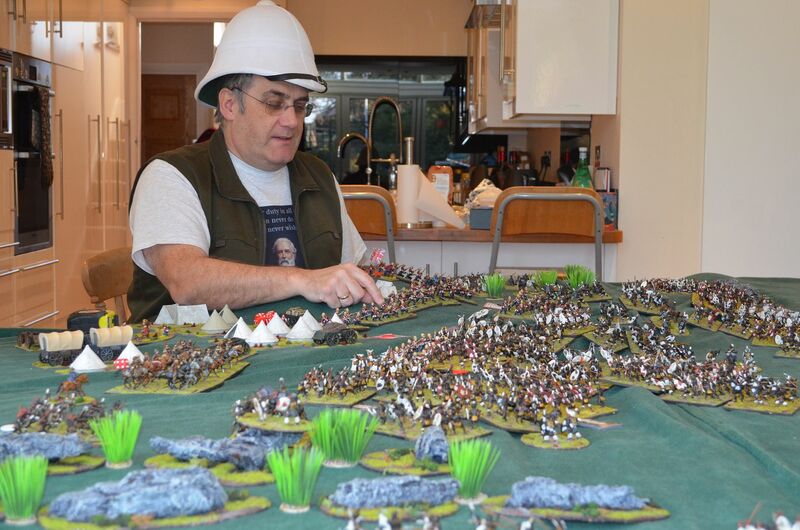 The Zulu Force – had to be divided into three horns with no horn more than 50% of the total warband count.The Zulu players could determine the composition of the horns and they would start from any edge facing the summit. 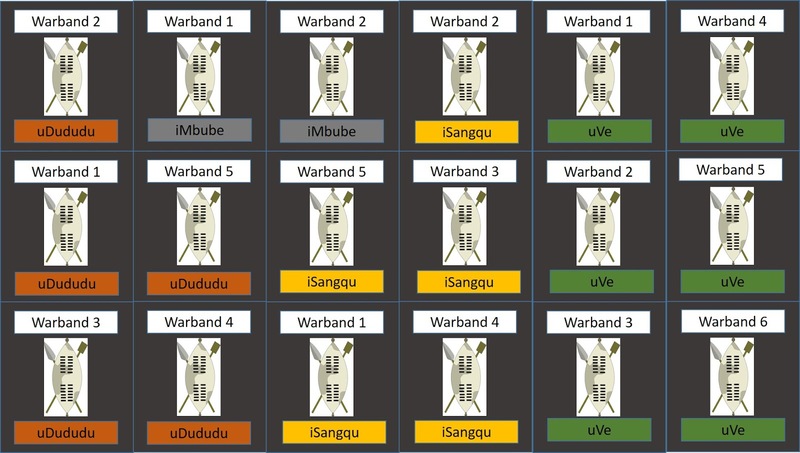 All the Zulu units were standard warband units as described in the book with no differention between married and unmarried units. 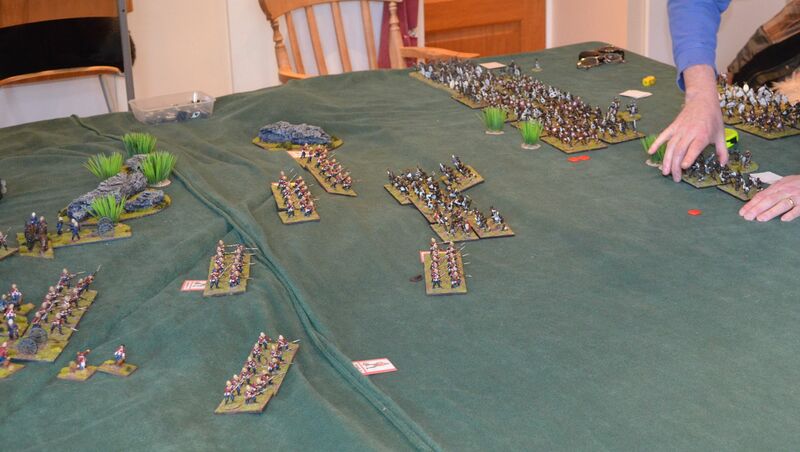 I think it is fair to say that nobody expected the Brits to win this game - they were severely outnumbered. 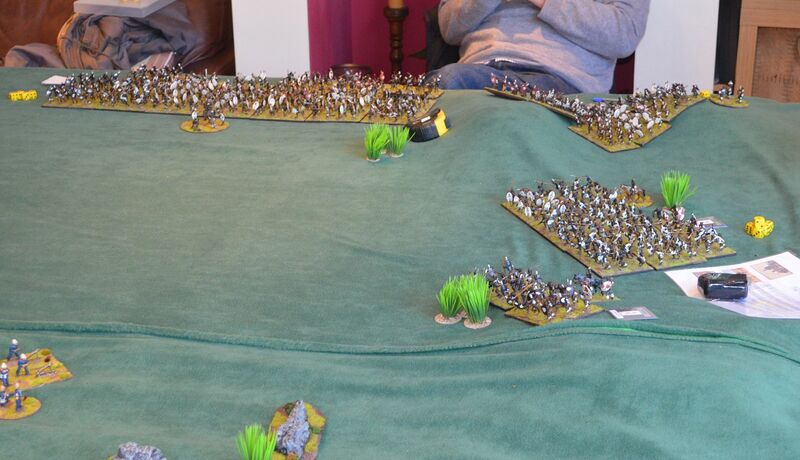 The following is a pictorial story of how our battle of Isandlwhana unfolded.. 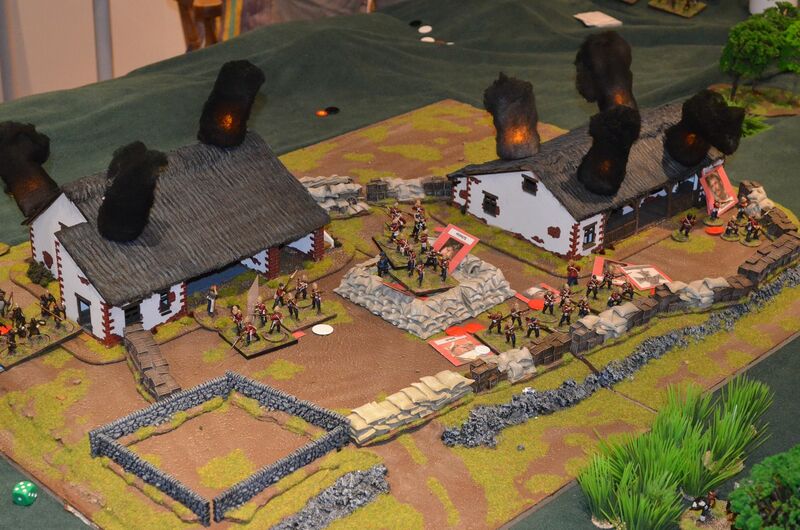 The centre and left horns pushed forwards to the British camp - the zulus making rapid advances- Centre picture is the advanced rocket battery - it scored a couple of hits ! 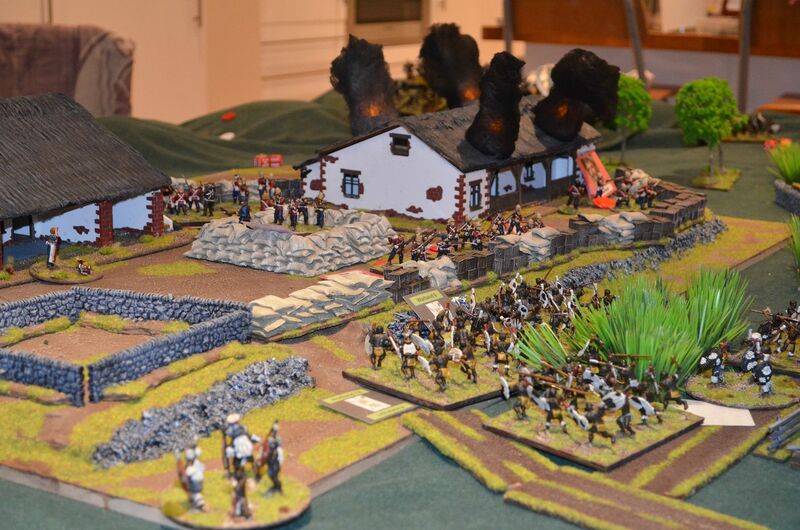 In three hours of game play the Zulus had won. The Butchers bill was telling. 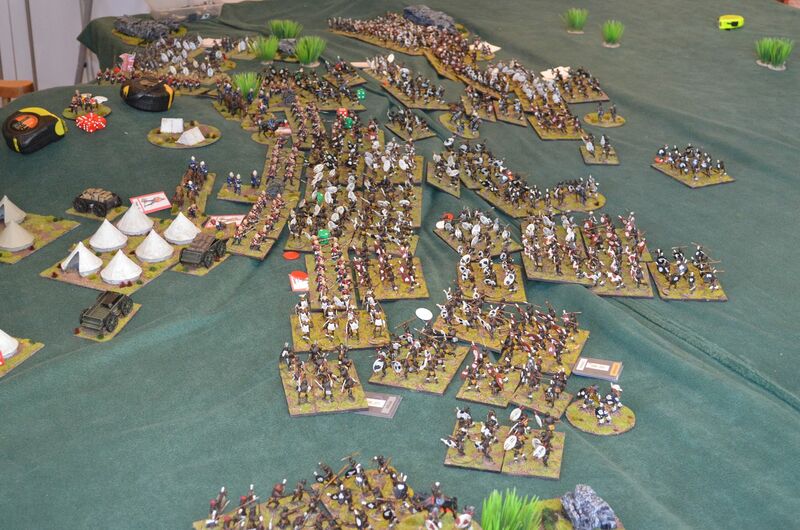 All of Durfords cavalry managed to escape shaken from viscous fighting with the left horn but what of the British line - massacred and the colours taken. The Zulus lost four only war bands with a number shaken and disordered. 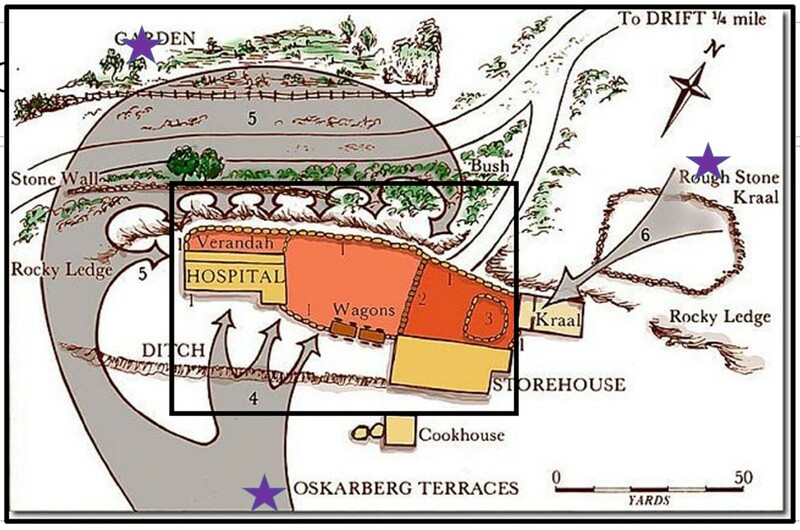 Interesting this put the Zulu casualties at about 1600 men. 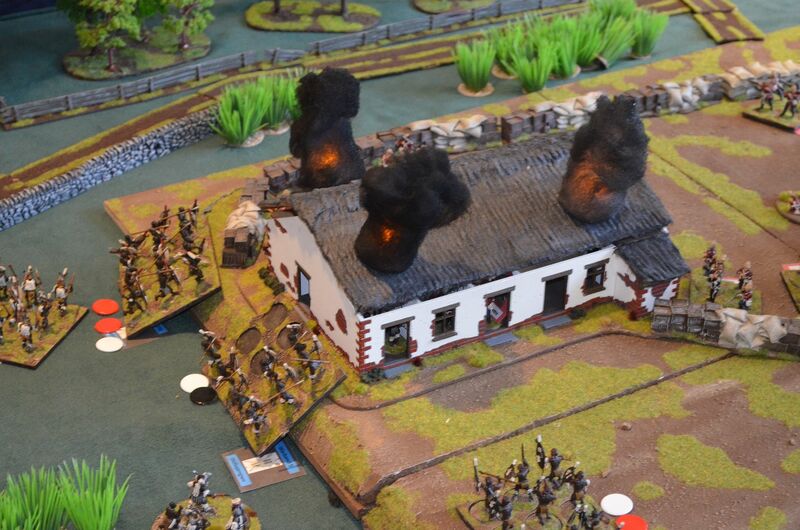 The real battle reports suggest the Zulus lost around 1000 KIA and an numerable number injured. In other words our game fought much like the real thing. 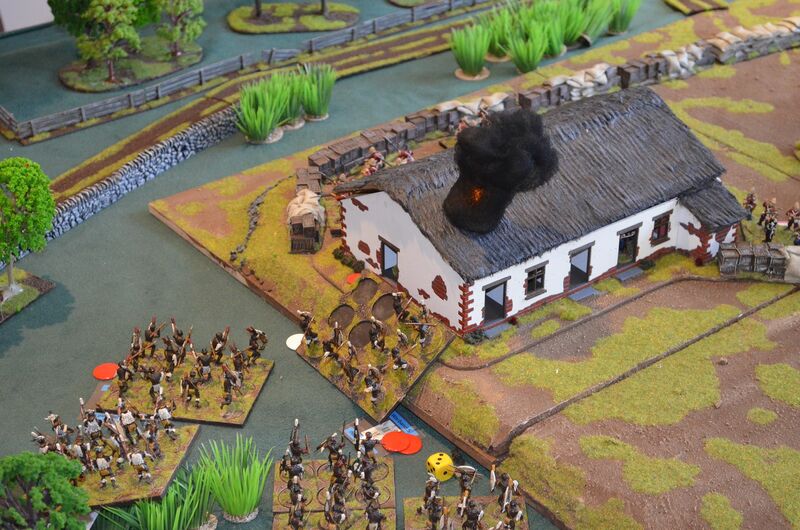 Just a couple of observations on the Black Powder rules. 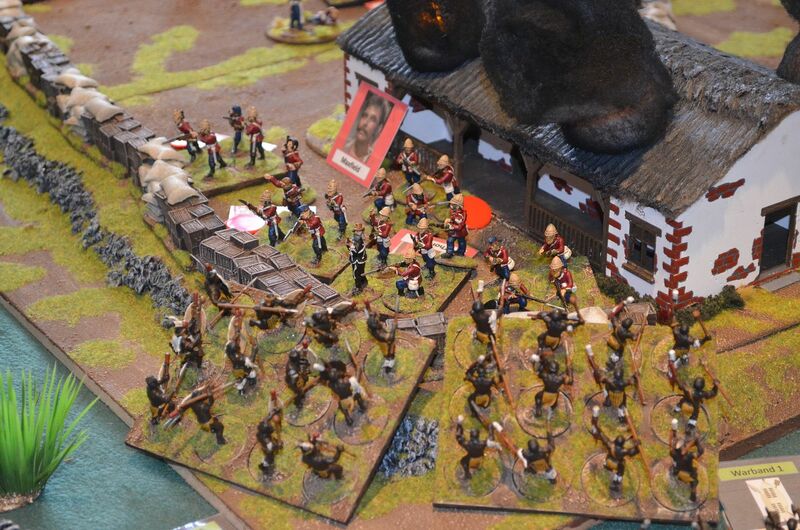 I had reduced the movement distances listed in the book - this worked well but the rifle ranges appeared to be a little short - at 18" the Brits only really had a chance to fire a couple of times into the Zulu units before engagement. In hindsight these probably needed to be extended. 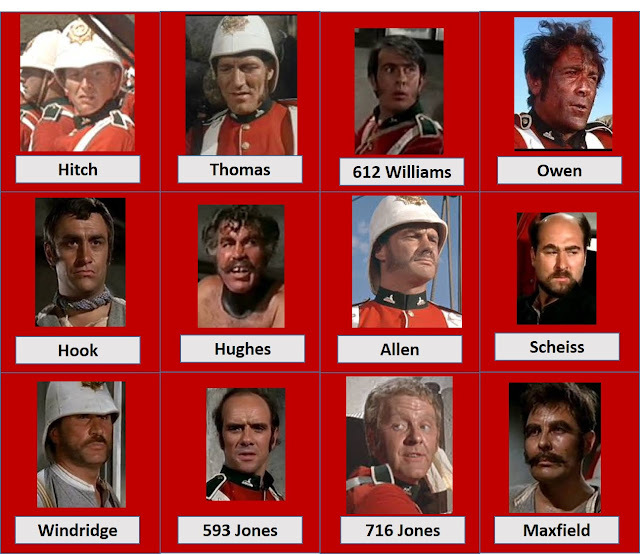 Thanks for reading and in the next post I'll be sharing our re-fight of Rorkes Drift.